With Vidyalaya Student portal, have quick access of all the necessary school information at your fingertips. Here, in this time of year when kids are back to school and parents are all worked up to ensure their kids have a smooth ride with academics and other curricular activities at school. Now, mobile devices have found their way into the classroom, so why not explore some of the innovative ways school and administrators uses mobile apps to engage students, faculty, parents, and the community? VIDYALAYA is a student portal which connects students, teachers, and parents and Vidyalaya also offers school’s own mobile app with their School’s name. Hence, all one needs to explore more possibilities of a mobile phone than gaming, shopping, and video watching. School apps now enable to be connected with your child’s school via your mobile. Timetable – Exam Time Table can be received to student and parents directly on the Student portal. This will be helpful to continue their study and create a schedule to prepare themselves for exams. Behavior Update – Student will receive their Behavior on the Student Portal so the student can improve their behavior for negative behavior in school. For positive behavior, the student feels motivated. Result Sheet – Result sheet in PDF format can be checked from the Student Portal also & can download the result sheet. Gallery – The Student can see and download photos of any activities, school, or other events added from the Teacher or School Administration end. Staff & Student Birthday Alerts – A Student can check the birthday for previous, current and future date of students from Student Portal. This will be helpful to plan surprise or gifts also. Events & Activities – Events and Activities will be received to the student on the Student Portal. In this way, the school doesn’t need to print and given to the individual student as will take too much off time for printing. Classwork/ homework – A student also received notification for Classwork/Homework from Class Incharge and this will be helpful to the absent student as they were not aware of academic status for an absent date. Assignments – A student can check assignment given for respective subject from the Class Incharge from student portal and student need to complete an assignment within a limited time. Student portal helps the school to create Eco-friendly or Green campus as the use of page become decreased. 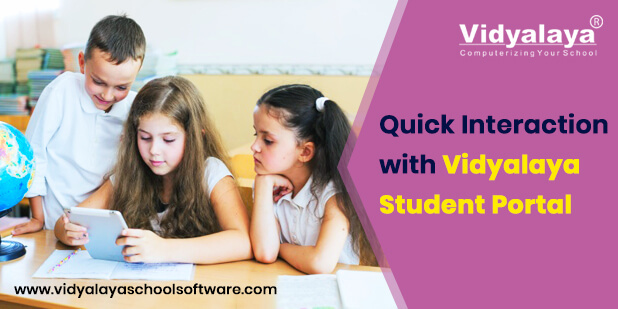 Vidyalaya Student Portal creates interest to complete their school tasks like homework, event, activities and also makes easy to end their home works within time. So yes, Vidyalaya Student Portal surely bridges the gap between Students, Parents, Teachers & Management & keeps them updated. The concept of making system automated is a step ahead to digitalised our education system.Which is quite necessary to stay organised and transparent.I am also familiar with a software that do the exact work like school management software, EDWAO which is a virtual campus assistant, it is fully configured to meet the diverse demands of schools.